Hello and happy Tuesday! This week the Tuesday Morning Sketch challenge #411 is celebrating Christmas in July along with our weekly sketch challenge. 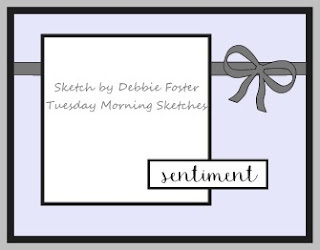 This week the sketch was designed by our own Debbie Foster and it's an easy one too. Just make a Christmas card using this sketch and enter to win some great prizes! 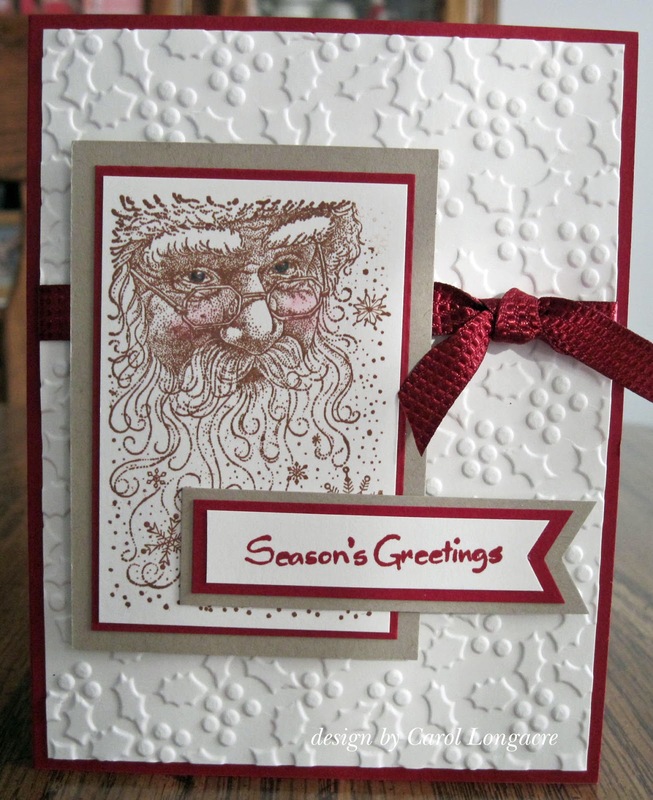 I flipped the sketch to make a regular side-fold A2 card, using a Santa image by Stampendous. I stamped the image with vintage photo distress ink, and then added some cheek color with chalk and a q-tip and made his eyes blue with a marker. The matted layers used were Cherry Cobbler and Kraft, and the ribbon is by SU! The vanilla background was embossed with a Sizzix Snow Globe ef and the sentiment is from Northwoods. Be sure to follow the rules, sketch, and theme each week as there are weekly prizes plus a grand prize that will be given away to someone who has participated in each weekly challenge during our anniversary month. Please make sure to link to your card entry, and not just to your blog. as well as the CHNC Extra challenge for July 2017. Have fun creating and we'll be around to visit real soon! Good luck everyone! Have yourself a fantastic day! This is a vintage Santa, that has such appeal! You used it perfectly, and I love that he is not in black. Great card, I love that sweet Santa image and the great embossed background. I already am doing Christmas cards this month, so I plan to play along with this challenge too! I love that Santa stamp and what you have done with this card. The embossed background is lovely, and I like the burgundy red ribbon. It goes so well with the vintage look of the Santa stamp. Beautiful card! Perfect! Love the Santa face. Never too early for Christmas spirit. I love your card Carol! The Santa is perfect with the chalk coloring. Great colors and background embossing. A gorgeous card Carol, a super Santa and lovely embossed background. Beautiful vintage Christmas card. Love how you added the color to Santa. I absolutely love this Santa stamp Carol, and the the fabulous embossing is great too. a beautiful card. A Beautiful and stylish Christmas card, love that ef too. I have been so tempted to buy this stamp! I've stamped some images from a friends stamp to play with for now. Welcome to the team! So glad to have you. GREAT card layout from the sketch and I just adore that Santa image. beautiful card. Love the embossing on this - so crisp! So pretty!! I love the simple red/white combo and that embossed BG!!! That's a really neat image...great job with the card and sketch! Gorgeous card Carol. The embossing is perfect - makes it feel like it's snowing in the background and I love the vintage Santa images. Amazing embossing, just perfect to make the Santa stamp pops!! Great design, it's a very elegant and beautiful card!